Philosophical anthropology Why would a blog on systems thinking be concerned with philosophical anthropology? Because systems thinkers themselves claim that systems thinking, including systemic design, may be traced to the origin of man. Churchman writes: “It’s quite likely that the tradition of the systems approach goes back to primitive man.” One of his students, Harold Nelson, writes: “Humans did not discover fire – they designed it.” The German-Jewish philosopher Helmuth Plessner, who survived German Nazism by fleeing to the Netherlands, elaborated on what everybody more or less knows: human beings, and that probably includes prehistoric man, cannot stop thinking and doing new things. A similar observation was made by American management scientist and philosopher Churchman: people think and do new things, but not always for the better. Problems abound, people disagree, solutions fail. Perhaps things would improve if we had a better understanding of reality, human nature, problems and how to go about them. Assuming Plessner, who pioneered the then new discipline of philosophical anthropology, may hold part of the answer, I made a concept map of his core ideas. I also described the concept map and added a few notes. Eccentric positionality ….is Plessner’s self-coined term for the particular pre-rational, pre-conscious situation all humans find themselves in. As an apriori characteristic of the human mind it is easiest to understand by making a comparison with the animal mind, say of a dog. Animal minds work mostly instinctively, by reflexes, that is by responding directly to external stimuli, without much learning. The animal mind is mostly in the center of its experience of life. The human mind works in a completely different way, namely by separating out a number of perspectives as a necessary precondition for its learning and inquiring habits. A person experiences his/her body internally in the same way as an animal (1), but in addition also creates a conscious mental image of his/her body (2) in its environment (or theatre of operation) as one body among others. Similarly, people experience psychological activity directly as a constant source of urges (3), like animals, but also use their mind as a mental apparatus to consciously, reflexively and deliberately apply to anything that catches their interest or attention (4). Finally, people have a non-reflexive ‘I’-dentity (5), which differs from their ‘constructed’ social identity as part of a larger ‘We’ (6). Their non-animal consciousness and mental activity are the result of the outer perspective, which positions them eccentrically, that is at some ‘distance’ from their more animal-like inner centre. Bipolar biology Plessner summarizes the previous paragraph by stating that human eccentric positionality is the result of human double aspectivity (i.e. having both an inner and outer perspective). This is deeply rooted in the bipolar nature of our bodies, which have both a mental and physical pole. The resulting eccentricity extends to all three worlds, the inner mental world, the outer physical world, and the social middle world. Plessner concludes that people are hard-wired to be eccentric, which means they are also hard-wired to seek re-establishment of the animal sense of unity or centricity. In other words, man’s atavistic centripetence is what defines him as modern human. Anthropological principles Plessner derives three anthropological principles from this eccentric positionality: (1) natural artificiality; (2) mediated immediacy; and (3) utopian location. Natural artificiality points to the idea man is always seeking to re-establish centricity, which urges him/her endlessly to discover and invent things, from technology and culture to institutions and systems. Whitehead (in The function of reason: 8; see also below) speaks of a three-fold urge (i) to live, (ii) to live well, and (iii) to live better, where the last instance purports to acquire an increase in satisfaction (which Plessner claims – and experience shows – to be always transient in nature). The second principle points to the idea that as a living body, we mediate our (immediate) contact with the world by getting our physical body to do things. This inherent instrumental nature of corporeality and its limitations implies the need to enhance our bodies by means of discoveries and inventions. We cannot experience the world directly, so we must make use of models to modify our environment. Warnings against totalitarianism The third principle may perhaps be linked to Plessner’s biography and his being half-Jewish and born in Wiesbaden, Germany. The principle says that man’s fundamental homelessness and inadequacy produces a sense of uncertainty and insecurity, which makes him/her susceptible to various forms of idealism. Like contemporaries such as Popper and Churchman, Plessner warns against the lure of totalitarianism, although each of them does it in his own way. Churchman does so by pointing out that so-called solutions almost always involve some train of reason which ends in totalitarianism, especially when solutions are large scale, say global, which may nevertheless seem necessary (Spaceship Earth: “Houston, we have a problem”; Houston: “We are the problem!”). The same applies to Popper who said that large-scale solutions should be ‘feared’, so it is better to opt for small steps and closely monitor what happens before deciding on any next step. 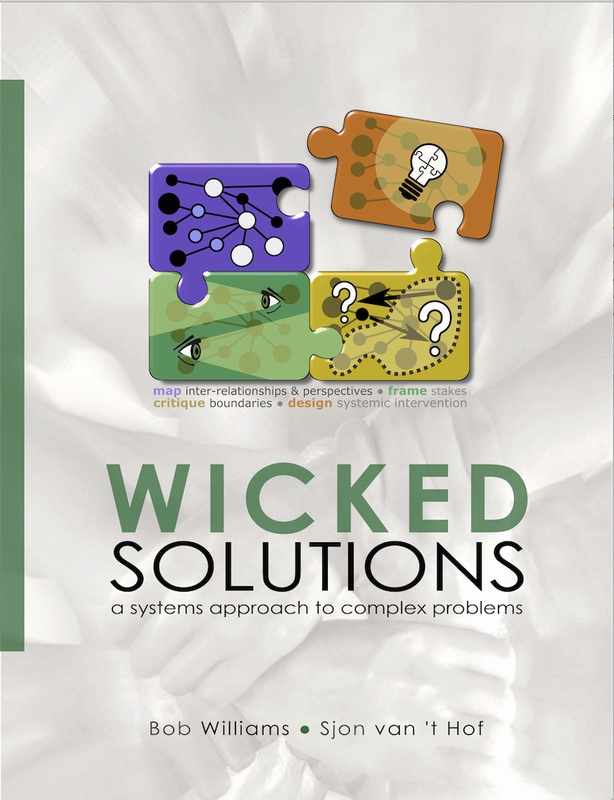 Ideal planning (as in Wicked Solutions) is a way of formulating ideals for systemic inquiry of each next step. The dialectical systems approach of Churchman could be considered a thorough form of critical inquiry to elucidate any potential negative implications to any potential victims so as to improve planning. This is also a precondition for real transparency in decision-making. Capra, Whitehead etcetera Whitehead’s process philosophy derives from a phenomenological-philosophical analysis of human experience, not entirely dissimilar to Plessner’s. An examples is where Whitehead speaks of the “withness [of the body] that makes [it] the starting point for our knowledge of the circumambient world” (1978: 81). Whitehead incorporated evolution in his philosophy, which he himself characterized as a philosophy of organism. One of his conclusions is that the whole of nature is organic and sentient, all the way down to atomic and subatomic entities, an idea that has been much ridiculed. Much later, Fritjof Capra (and Pier Luigi Luisi) looked at evolution, especially at the very beginning the origin of life, and the origin of the human species and the evolutionary link between consciousness and social phenomena (Capra, 2014). Capra incorporates a lot of systems thought in his book, which holds may insights that are complementary to those of both Churchman and Whitehead. No single system of understanding or inquiry can ever hope to encompass the whole of human reality. Perhaps a juxtaposition of the major representatives of three or four schools of thought or disciplines (systems philosophy, anthropology, evolutionary biology, pragmatism, phenomenology) could help us stay in line. If this post is anything to go by, then Churchman, Plessner, and Whitehead are good names to start with. 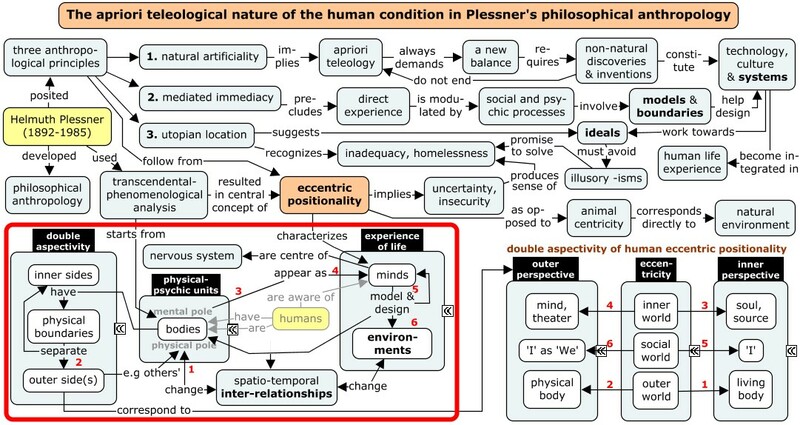 Afterthought In this blog post I have shown how three great ideas can be seen to converge: 1. a naturalistic diagnosis of the human condition (Plessner); 2. a speculative cosmology of the processual nature of (human) reality involving e.g. bipolar actual entities (Whitehead); and 3. a pragmatic systems approach to properly handle (human) ideals and wicked problems (Churchman). A fourth idea could also fit in, but is not dealt with in this post: a systemic view of life (Capra), which has interesting linkages with the other three. I admit to be aware that most people will be totally disinterested in anything resembling cosmology, philosophy and anthropology, while the remaining people will be keen to defend other cosmologies, philosophies, and anthropologies, usually from a religious vantage point. The trouble with most religions is that they not only tend to rely on faith, promises of heaven or paradise, and other illusory mental schemes, but also tend to encourage division between people in varying degrees, some extremely so. Besides, they fail to be of much pragmatic value, except where they encourage a general benign attitude to other people, which could provide fertile ground for ‘great idea no. 3’. The advantage of such a ‘great scheme of convergence’ is that it does not necessarily make any illusory claims that require a leap of faith, so it can be subjected to critical inquiry or used as a framework or system of inquiry.